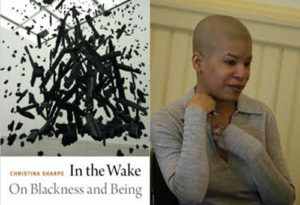 Counterpath is excited to host a talk with Christina Sharpe, author of In the Wake: On Blackness and Being (Duke UP, 2017) on Thursday, April 5, at 7pm. The event is free and open to the public. Leading up to Sharpe’s visit, at various locations we will also facilitate four meetings of a reading group dedicated to the book, each meeting focussing on one of the four chapters. The schedule is as follows and please write to counterpath@gmail.com to get on the reading group e-mail list. Attendance is open to all, the group is free of charge, and no one is either expected to show up at all meetings or to have read the book. 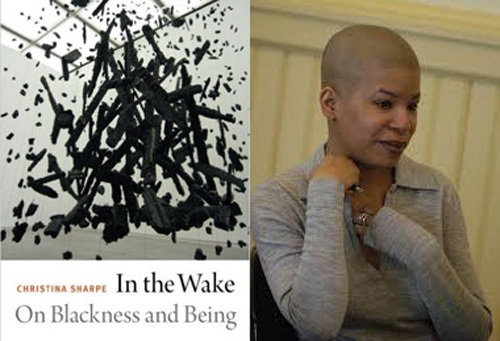 In this original and trenchant work, Christina Sharpe interrogates literary, visual, cinematic, and quotidian representations of Black life that comprise what she calls the “orthography of the wake.” Activating multiple registers of “wake”—the path behind a ship, keeping watch with the dead, coming to consciousness—Sharpe illustrates how Black lives are swept up and animated by the afterlives of slavery, and she delineates what survives despite such insistent violence and negation. Initiating and describing a theory and method of reading the metaphors and materiality of “the wake,” “the ship,” “the hold,” and “the weather,” Sharpe shows how the sign of the slave ship marks and haunts contemporary Black life in the diaspora and how the specter of the hold produces conditions of containment, regulation, and punishment, but also something in excess of them. In the weather, Sharpe situates anti-Blackness and white supremacy as the total climate that produces premature Black death as normative. Formulating the wake and “wake work” as sites of artistic production, resistance, consciousness, and possibility for living in diaspora, In the Wake offers a way forward.